It took a while. I’ve started, unraveled, started, unraveled, started, unraveled… started, had my toddler unravel, etc. etc. etc. When at my folks’ house for a short vacation, I picked up some clearance yarn at Michael’s craft store just to play around with. I might have been the ability to focus a little more clearly, but I think I just finally found my groove. No extra stitches, no split yarn. Yay! 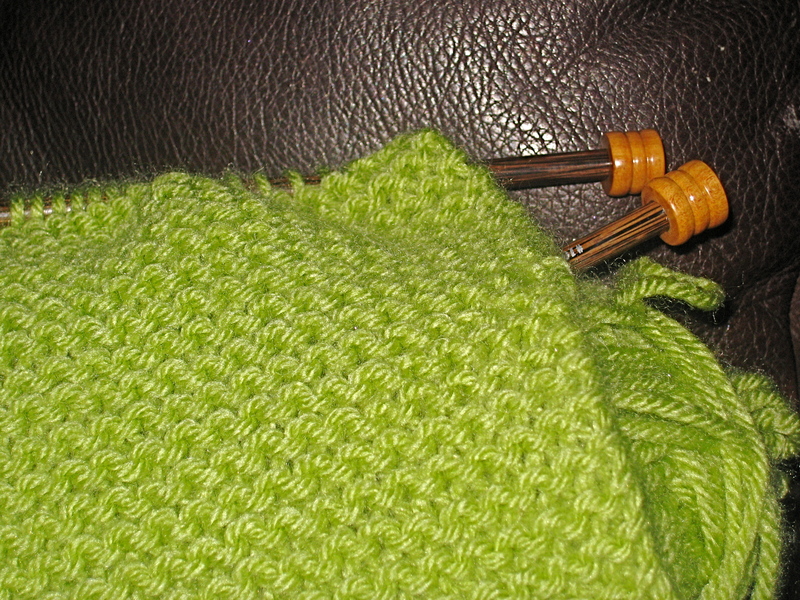 The yarn is Lion Brand Vanna’s Choice in a bright lime green. It was on clearance for a buck-fifty. My biggest challenge now is that the end of the skein is a big knotted mess. There’s gotta be a better way. I think I’m (literally) going to cut my losses and start with the second skein. Will post more progress soon.